Giveaway winner will be announced on Wednesday. Thank you for playing. 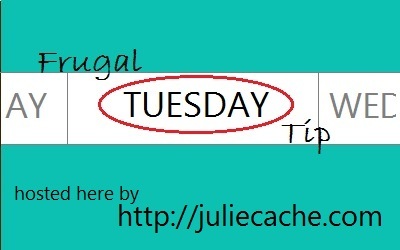 Make a “Frugal Tuesday Tip” post on your own blog, include a link in your blog post to this Frugal Tuesday Tip post, then come back here to add your post to the linky box below. Your blog post will appear on all three of our blogs! If you don’t have a thumbnail picture to share, use the “calendar logo” above — just follow the script’s super-simple prompts. If you don’t have a blog, you can still play! Just add a comment to this post with your ideas or questions about frugality. Is that the right way to link it?! Thanks for your help! yes! you got it! i’ll delete the other one. happy blogging to you.